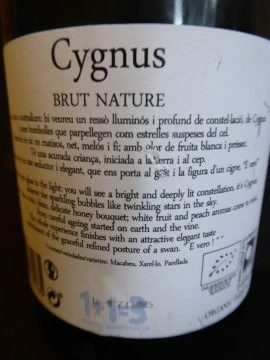 This Cygnus Reserva Brut Nature is an organic white sparkling wine produced as a Cava by the U Mes U Fan Tres (1+1=3) winery in the Barcelona area of Spain. My tasting notes say that this wine has a light yellow color with fine bubbles. 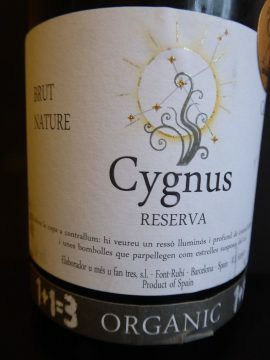 The nose is elegant with hints of lemon and toasted wood. 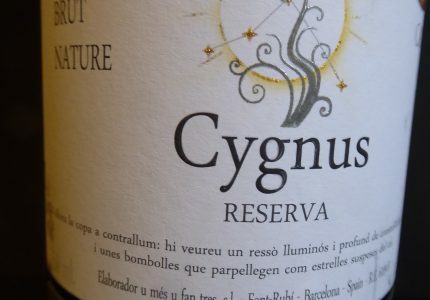 This Cygnus Reserva Brut Nature has a medium body with hazelnuts and toasted wood aromas. The bottle had a small label saying it got 91 points by Robert Parker.